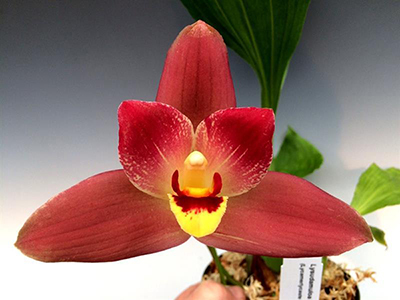 Lycaste hybrids are beautiful plants producing multiple-bloom spikes from the base of mature pseudobulbs in the winter and spring months. Their flowers are large (3 to 6 inches), long-lasting and fragrant. Grow these plants in medium light as you would for Cattleyas (2000 to 3500 footcandles). Keep them in shady conditions during the bright summer months and in strong light during the fall and winter months. This plant prefers intermediate to cool temperatures. Nighttime lows from 50 to 60 degrees Fahrenheit and daytime highs from 68 to 75 degrees are ideal. Summer temperatures will be slightly warmer. 50% or higher is ideal. Use rainwater, distilled or reverse osmosis water. Lycastes love water, especially during the growing season from late March through late November. Water as the mix becomes slightly dry. Observe the pseudobulbs - as long as they are full and plump, you are watering correctly. If they are shriveled, you may be under watering, or the roots might be rotting from over watering. Keep the plant slightly dry between watering from late fall until you see a spike emerge. Then water more regularly. Many Lycastes are deciduous and will lose their leaves in the winter to early summer months. It is not unusual if the leaf tips turn brown before they fall off. Once new growths begin, water more frequently, allowing the mix to only approach dryness between watering. Phalaenopsis orchids are of a monopodial growth without any pseudobulbs to help store moisture. For this reason, it is important to provide good humidity. 50-70% is considered ideal. However, if the plant is kept well watered, it will adapt to a lower humidity. Use Green Jungle Orchid Food for best results. If your Lycaste is planted in bark, feed every other time you water. If potted in moss, feed every 3rd or 4th time you water during the growing season. In late fall, around the end of November, stop fertilizing and use clear water only. These plants typically bloom in the late winter to early spring months with large 3 to 6 inch flowers emerging from stems at the base of the largest pseudobulbs. Large specimens produce multiple spikes and can be quite impressive. Support the spikes before they bloom or the flowers will cause them to sag downwards. Repot this plant after it flowers, into a fine or medium bark mix or New Zealand sphagnum moss or rockwool cubes. Lycastes may be divided once they develop 6 or more pseudobulbs. The old bulbs can still produce new growths eventually but sometimes they take up to a year to do so. Receive 10% off your first order for subscribing! © 2019 Orchids Limited. All rights reserved.